Sohar Beach Hotel by Swiss-Belhotel is located on Sallan Beach in Sohar, Oman. The Sohar Beach Hotel is easily accessible from the Oman, the UAE borders of Hatta and Buraimi. 200 KMS from Dubai and 240KMS from Muscat. Ancient capital of Oman and birthplace of Sinbad the sailor, Sohar is located on the lush Batinah coast and lapped by the calm waters of the Gulf of Oman. The coastal plain of rich agriculture land and palm -fringed beaches is often described as the “breadbasket of Oman”. The quaint town owns much to the fishing and farming industries around it. A visit to the fish souk is a must for visitors. Early morning and early evening fishermen beach their boats at the market and disgorge their catch - a variable Neptune’s harvest of shark, sailfish, grouper, snapper, lobster and shrimps. Sohar’s labyrinth of streets and alleyways is a boon for shoppers and tourists. The town retains it’s old fashioned charm, successfully combing the traditional Omani way of life with its twentieth century needs .At it’s heart lies a beautiful restored fort, and a magnificent Corniche sweeps the coast. 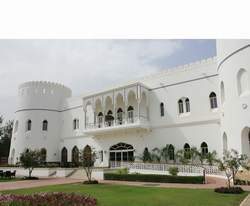 Sohar is ideally situated for those wishing to explore the countryside. Located close to Sohar are ancient copper mines, and a short journey into the foothills of Jebel Akdar (the Green Mountain) reveals the delightful fortified towns of Ibri, Nakhl, Rustaq and Nizwa. Choice of one king or two queen beds. Interior design for leisure guests with large area. One bed room an individual balcony and overlooking the landscape garden which surrounding the swimming pool. Satellite TV including international channels. Interior design for leisure guests with large area. One bed room an individual balcony and overlooking the landscape garden. Interior design for chalets is for family guests. Chalets have their own private entrances, overlooking either the beach or the landscape garden which surrounding the swimming pool. Both the double bedded executive suites are in two buttresses of the fort like structure overlooking the landscaped garden and the main pool. These spacious and immaculately designed suites have a living room with dining set, plush interiors with a balcony overlooking the garden. All standard amenities like tea, coffee making, mini bar fridges, three bottled water are present in addition to two televisions, IDD telephones. The bedrooms are in round shape with windows having excellent view. All four deluxe suites are situated in the heart of the hotel overlooking the lush landscaping and the swimming pool. Each deluxe suite consists of two bathrooms, a spacious living room with balcony connecting to the master double bedroom. The interconnecting doors can be locked on guest request. The living room also consists of a kitchenette with spacious cupboards and a sink. Each deluxe suite has two sets of mini bar fridges, television, tea & coffee makers, IDD telephones with ample seating. The presidential suite is exquisitely designed in one of the buttress of the fort like structure with tasteful interiors with gold leaf and a large area with two separate balconies. Each area with a temperature controlled air-condition and IDD telephone facility. The entrance has a waiting area leading to a spacious living room with a balcony the lush landscaping. The mini bar and the large television adore the living room which is connected to a board room with spacious seating for ten persons including all audio visual modern setup. Dressing area with large cupboards, iron and ironing and attached to a large bathroom with vanity counter & bathtub having the shower stall option. Sallan Restaurant & Terrace is a multi cuisine eatery with an open air terrace overlooking the sprawling lawns and the swimming pool. Fully licensed to serve beverages, the Sallan Restaurant & Terrace offers Arabic, Indian and Continental cuisine for Breakfast, Lunch and Dinner from 6 am till 11 pm midnight. Sohar Beach by Swiss-Belhotel specializes in pairing ideal meeting venues with impeccable service. From exclusive board meetings, to product launches or corporate-wide celebrations, we ensure all your events are memorably excellent. A beautifully appointed Banquet Hall that can provide an ideal venue for conferences, meetings, seminars, product launches, birthday parties, lunches, dinners, weddings and formal banquets.